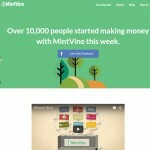 “MintVine”, by Branded Research, Inc and found at mintvine.com, is a website that pays you to take surveys and enter contests, etc., online. MintVine is free to join and you get points immediately for joining. It works on a point system. One hundred points equal a dollar. MintVine’s own initial surveys can be anywhere from 5 to 40 points and up and they provide funnel surveys that go right to their third party clients’ market research studies. While most of the internal surveys are in the low range, there might be surveys with higher points from their clients, but it is rare that you would see any over 100 points on individual ones. So it would seem you don’t make anything over a dollar per survey, and some take MintVine several days to clear the points when and if you do complete them. By that, I mean you might not qualify for many of the MintVine surveys due to eligibility because of demographic requirements and restrictions. I took me almost 2 hours before I got a survey I could complete, and it took nearly 2 weeks to earn enough to cash out. The points rewards were low, sadly enough, so MintVine may be a legitimate site where you get paid to take surveys, but it will take some time to earn. The MintVine minimum payout is 1000 points, which amount to $10 dollars. I’ve been trying to do daily surveys for 2 weeks and I still have not yet reached the payout. Other MintVine ways to earn money online from home are through trial offers and product tests in which you must either download something, join the clients’ sites, etc. Many of these free paid offers involve different tasks, games, gambling and other means. They don’t pay very much but they can be a fun hobby with which to kill time. MintVine is really no way to make money online from home, but, again, it can be an enjoyable way to spend time frivolously and earn a few pennies here and there. At least with the trial offers, you won’t get disqualified halfway through like some of the MintVine surveys do from time to time, more often than not. Just make sure that when you do the paid trials that you make at least 100 points per dollar you spend or it can be a loss. Also, make sure you complete and cancel the trials before their expiration date or you might get charged full amount for the products. MintVine also offers discounts on products you might buy for as much as 50% than a local store, so you can save money through them. Another way to earn a little extra is though MintVine’s referral program. This is not an easy way to earn, as you would need to invest in a website or landing page marketing system. The commission structure of MintVine’s referral program is 15% of what your referrals make on surveys and trial offers they undertake. Once in a while MintVine will give you 5 or 10 points even if you did not qualify for a survey, and that is a feature I have not come across most other paid survey sites. MintVine also has an exclusive member option you can pay to join which does offer a little higher paying surveys, but there are no guarantees you will qualify for most of them. You will never make enough through MintVine to quit the day job, and if you value your time and energy this would not be worth your effort. However, if you’re looking for a diversion that gives you a few bucks here and there then MintVine is one we would recommend for that endeavor. To sum things up, I do not recommend MintVine as a way to make much money, certainly not a living, but I do recommend it as a fun pastime for those looking to be entertained a little and make a little while doing so.